The Story Matters: Announcing our FABULOUS designers!! So much talent in one place! This new kit is going to be something to watch! From blog to website in a couple months, keep a watch on us! FRIDAY 10am CST this months kit goes on sale. If you miss this kit before it sells out, and want in on the next kit, subscribe-you'll be guaranteed a kit for the next month. If you wait to see what the kit looks like to order (trust me, you'll like it!) ya just might not get it! Sneak Peeks will be on the 15th of each month. We will order for all subscribed, but there will only be so many available for new subscriptions. REMEMBER, all subscribe on first kit purchase BUT you can cancel any month-BUT then you just might not get the next month! Each months kit is $24.99+shipping/handling. In the future there WILL be add-ons, project kits, themed kits etc... depending on what we develop. Each of the next two months will include new CHA releases, with some of the greatest stuff prior to CHA. Starting in May-ALL products will be new CHA releases... nothing prior. AND each month we will include something not available at your local store or chain. 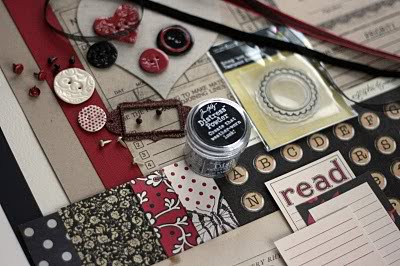 Whether it be handmade buttons or flowers or ephemera. Their be something special in each! OK, OK... so the kits will be fab! 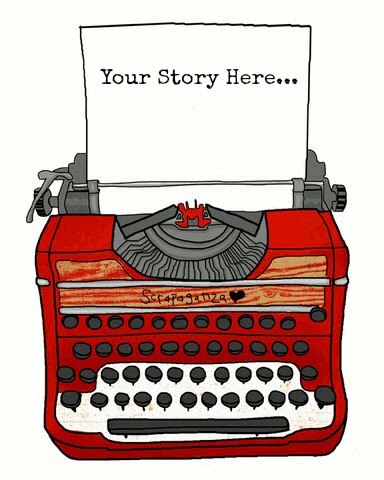 So who will be designing for The Story Matters? Visit each of the designers blogs, say "hey" and come back here and comment, and you could win a pack of Imaginisce Sweet Cheri to scrap your "Love" layouts! And start counting down! Cuz the first kit is comin'!! Limited quanities, so be ready on Friday! doin flips...i'm so excited! Okay, so maybe that's not a good thing to do being 8mo. preggo! :0) I'm just so excited! Whoot! Whoot! congrats ladies. Can't wait to see your work!! I am very excited to be on this team!! Great inspiration and fun is ahead!!! Can't wait to see the new kit and what the DT does with it. WOW! Some really great girls on the team. Looking forward to what they make. Awesome design team. Can't wait to see everyones work. I neeeeed this kit. I love it!!! I am sooooo excited about this kit. The design team is awesome and I can't wait to be inspired by all of you. Can't wait until Friday!!!!!!!!!!!!!!! Will you be handling payment on this website? If so, will you accept paypal? Sounds like a wonderful group of ladies you have with you. Best of luck to you!!!!! Super excited for you Penny and your fabulous staff!!! Congrats to all the ladies!!!! can't wait to see the new kit! sounds like so much fun! This is one kit that I can tell JUST from the sneak that I want it. Hope prompt is enough to get one. . .got it on my calendar (wondering if it will collapse at 10:01??? I finally got around to checking the whole DT out! Love them and this kit idea! I'm hopping around, love the kit! Looks like a great team. I look forward to seeing more of your talents!